Where’s Wallis? 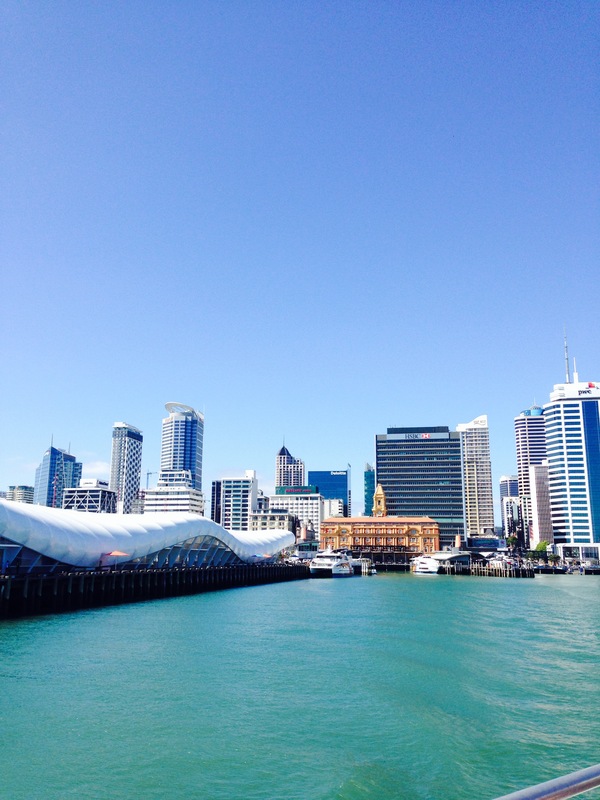 Auckland, New Zealand – Where's Wallis? The problem with these fleeting visits is that I’m rapidly adding to my list of countries I want to return to. 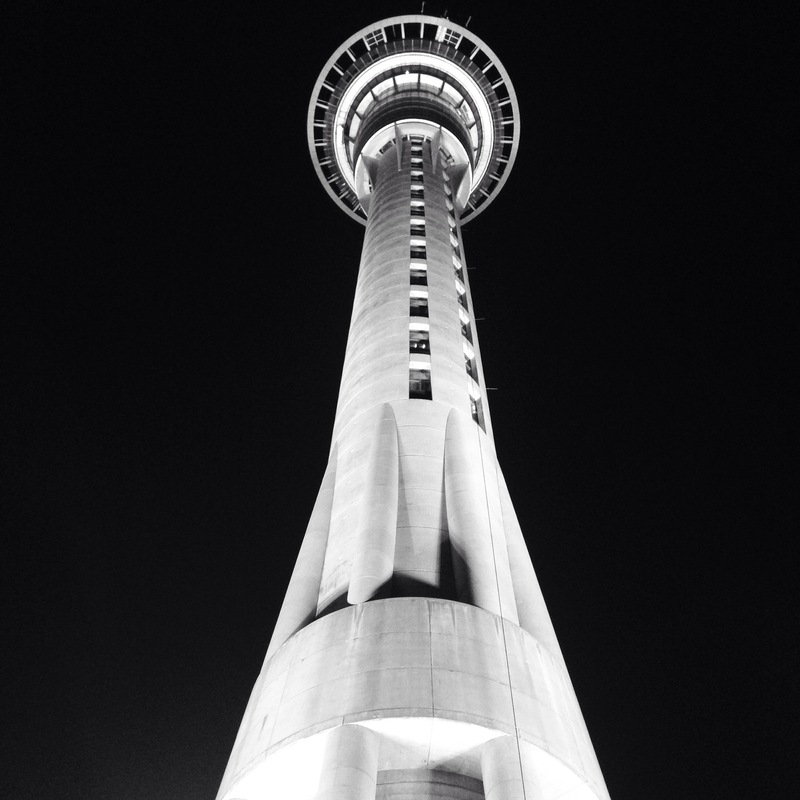 Three nights in NZ certainly wasn’t enough, but I used my time well with a jam-packed couple of days. We were only delayed half an hour by the storms in Fiji so landed in NZ about 3.30pm. Always annoying to spend a whole day travelling for a flight that’s only a couple of hours! I’d made plans with the older brother and sister of my ex-housemate Rosie, both of whom live in Auckland, to go over to her brother (Sam’s) house for a BBQ that evening. Her sister (Breanne) was picking us up from the centre of town at 5pm to drive us over to the harbour bridge to the area where Sam lives. ‘Us’ being me and Tim, a good friend of James’ from home. 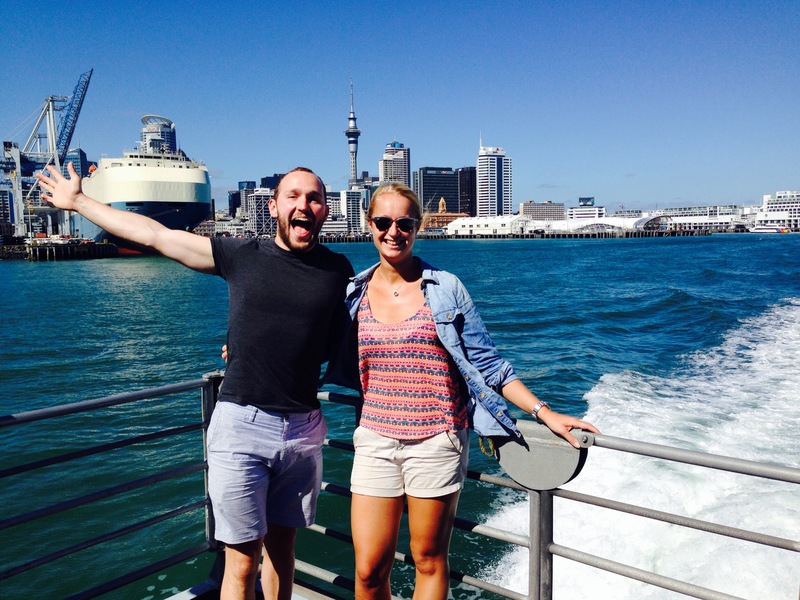 At my leaving drinks it transpired that my time in Auckland coincided with the beginning of his four months travelling. 1.5hrs was feasibly just enough time to get from the runway to the hostel. But as is always the way whenever you’re in a hurry things take as long as possible…there was a big queue for passport control, a queue to get cash, another big queue for the NZ ‘bio-control’ checks. The only thing that worked in my favour was that the shuttle between the airport and town turned up instantly when we got outside. I made it to the hostel about 5.30pm where I met Tim, dropped off my rucksack and we then headed straight to meet Breanne. I hadn’t seen her since we went on a skiing trip to the Alps for NYE 2012/13 so just over two years, it was really lovely to catch up. Oh an aside, the poor rucksack…it’s finally reaching the end of its life. It hasn’t been able to handle the pressure of my overloading and the back support broke above where it had previously been welded just as I got off the airport bus. It has done very well though, it’s lasted almost 10 years and seen a few continents. salads, and lots of wine. As soon as I saw the trampoline in the garden my eyes lit up, so I was delighted to have an excuse when Sam’s partner Tash’s little girls Eilah and Jasmine invited me to come and play on it with them. I introduced them to an old favourite game of my sister Iona and I, the egg game! The ‘eggs’ sit on the bed of the trampoline and lock their arms around their legs. The ‘cracker’ then bounces around like crazy on the trampoline trying to crack them. I had to be very careful not to jump on the girls though, a squashed child would not have been a good first meeting. The next morning we were up early and met Fiona to go for breakfast to line our stomachs for a day of wine tasting ahead. We went for a tasty breakfast at a place called Cafe Melba just off Queen Street and then strolled down to the ferry terminal. 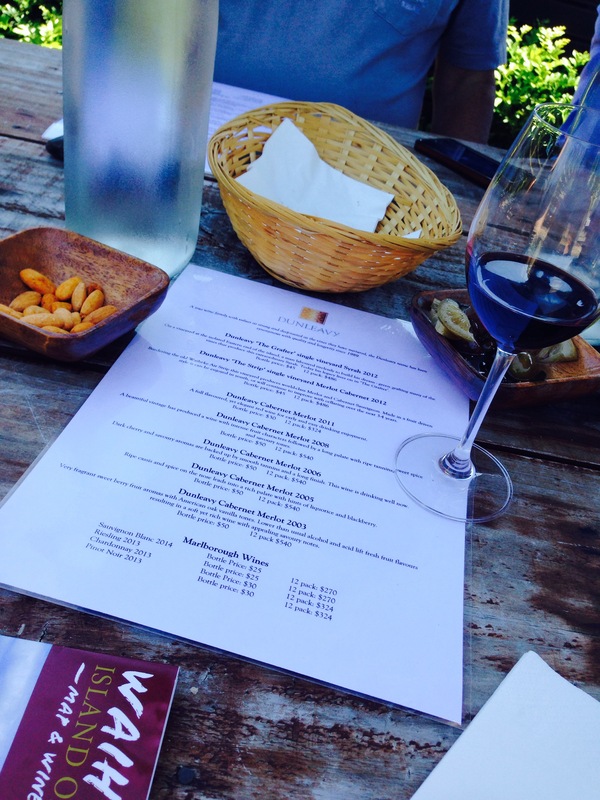 We’d booked onto a day trip to Waiheke wine island with ‘Waiheke island wine tours’. It was such a great day and so well organised. Waiheke which took about 45 minutes, where we were met by our driver for the day Graham. Also on our trip were Viv and Jen both from Auckland, though Jen now lives in the Scottish borders and Doug and Nancy from Seattle. 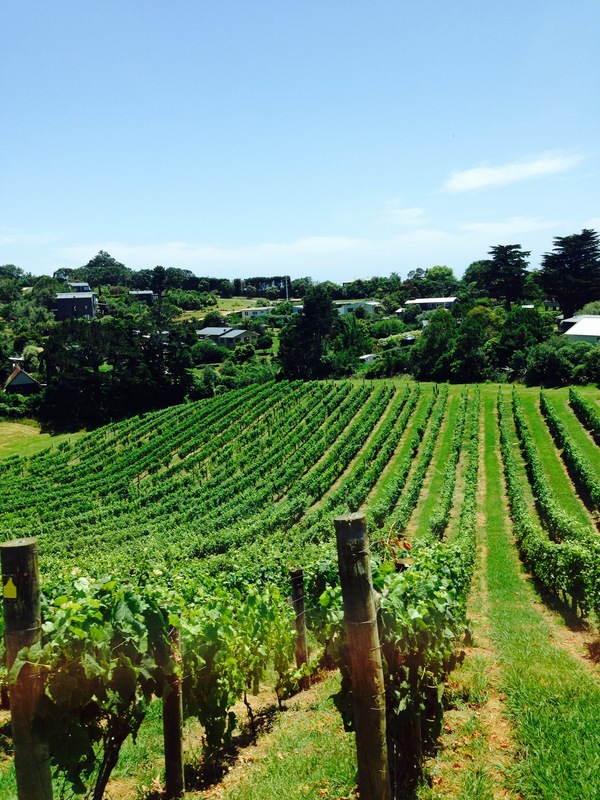 Waiheke island was stunning. It’s now on my real estate hit list, along with Lake Atitlan in Guatemala and Casco Viejo in Panama City. Although given I failed to buy a one bed flat in London I fear that an international property portfolio may still be slightly out of my reach. 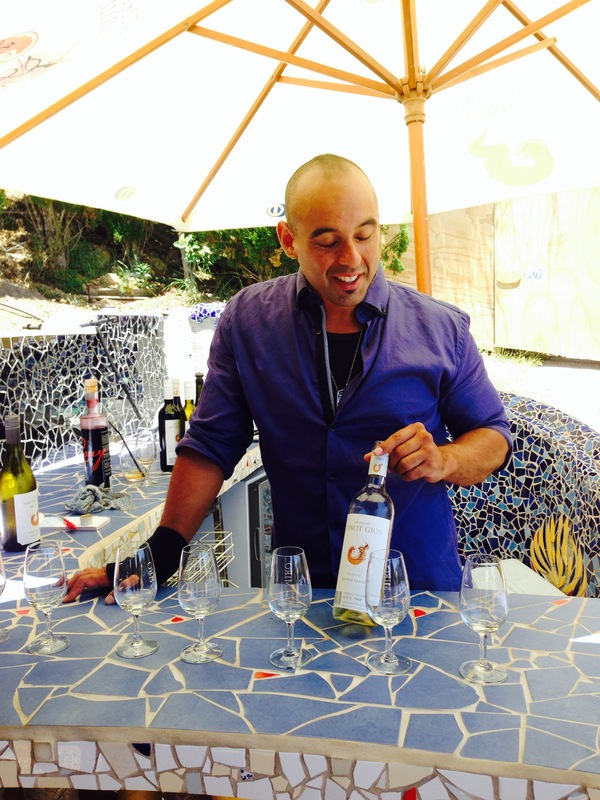 We went to 3 vineyards during the day: Te Motu, Obsidian and Casita Miro. All of them were great: really small and so picturesque, and we got to taste about 5-6 wines at each. 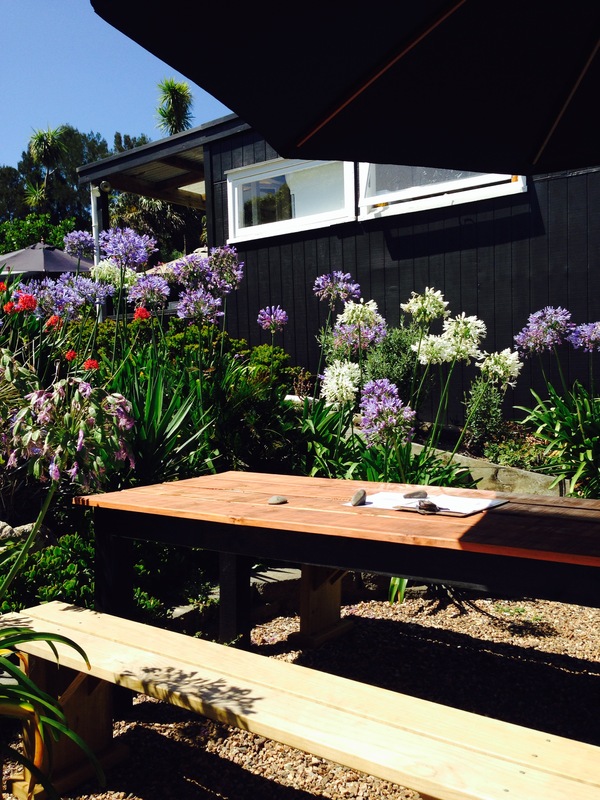 Te Motu was my favourite setting, with views over a small valley, wildflowers planted between the vines, an olive grove in the next field, and a lovely outdoor patio where we did the tastings. 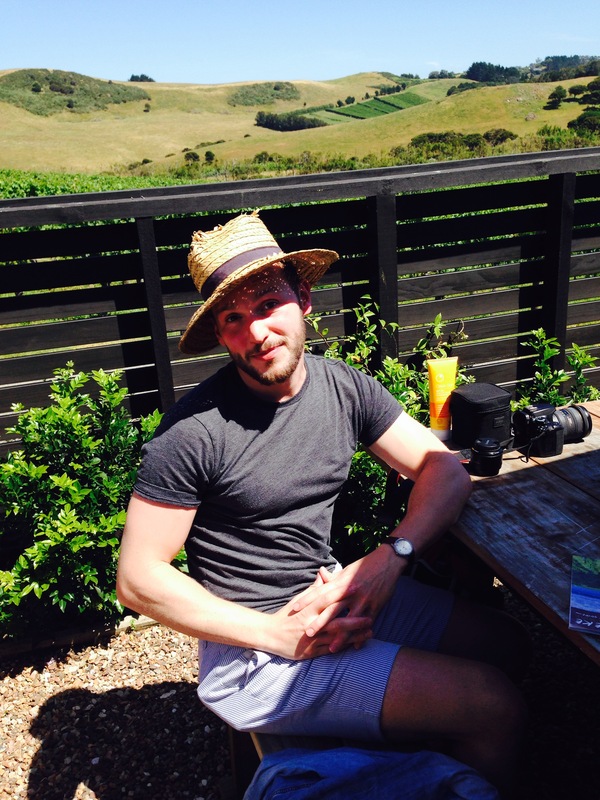 Tim was sitting in the sun and was quickly issued with their household straw hat, a great look. We were given marinated olives, paprika almonds and walnut bread to accompany the tasting. I am split between Te Motu and Obsidian for my favourite taste wise. The first two reds that we had at Te Motu I wasn’t keen on, but I also loved their Kokoro 2012 and Te Motu 2007. 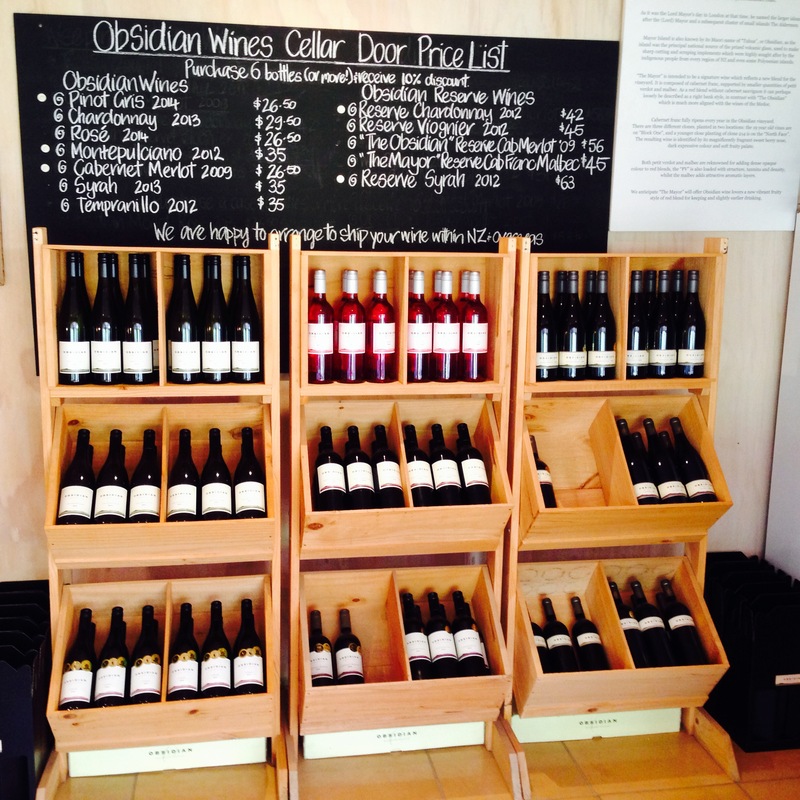 At Obsidian they had a great Pinot Gris which was so clear it looked like water. They also had a red called Montepulciano – I’d never heard of this Italian grape before but really enjoyed it. 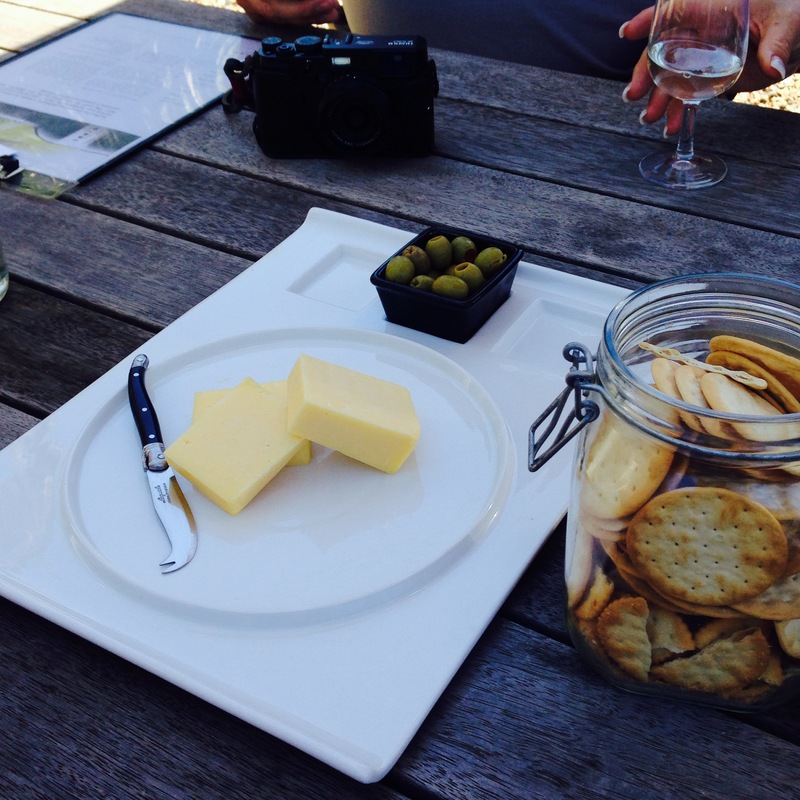 We had cheese, crackers and olives at Obsidian and sat at a beautiful covered table outside for the tasting. It was set at the bottom of a hill (Waiheke had lots of hills…I’m glad we didn’t go for the bike hire option we’d considered) next to their warehouse. 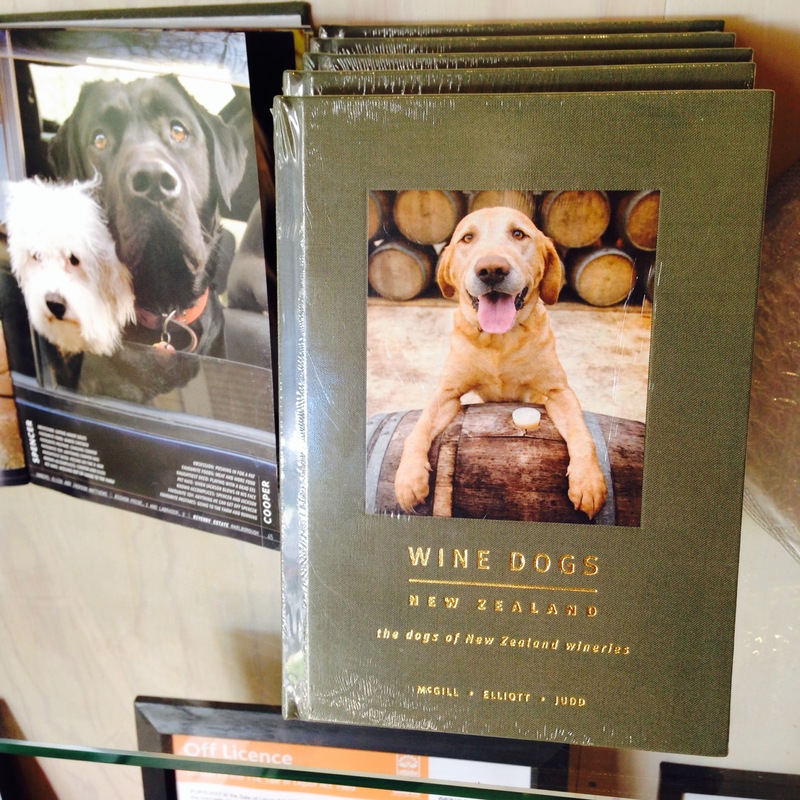 In the shop they sold a book called “Wine Dogs New Zealand – Dogs of New Zealand Wineries”…what an excellent combination! 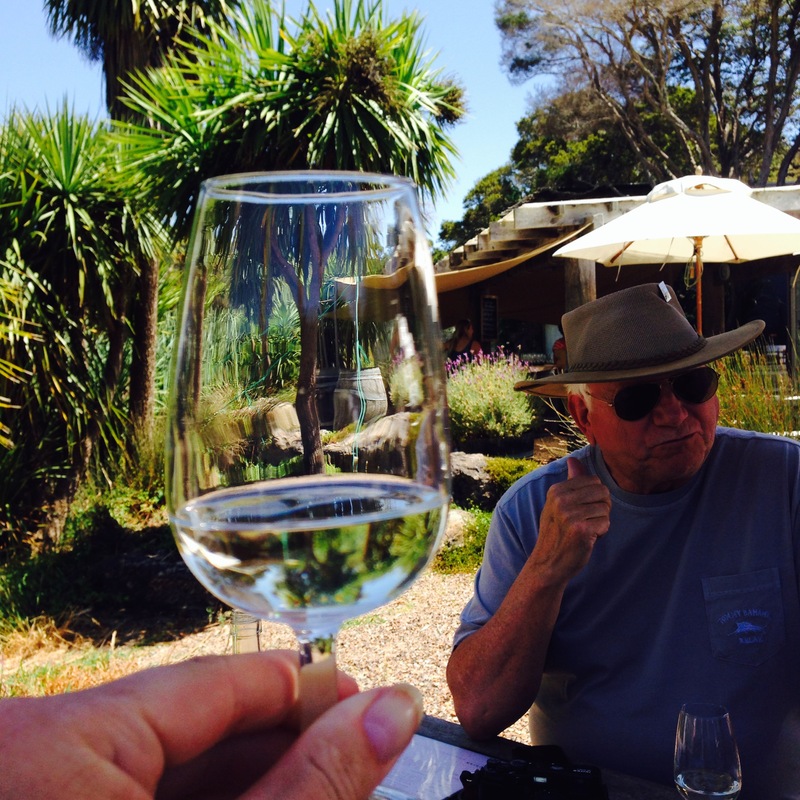 At Te Motu I learnt that roses are to winemakers what canaries are to miners. They are traditionally planted at the end of the vines to monitor the soil quality. If the rose shows distress then it is likely that the grapes are also suffering due to a problem with the soil. 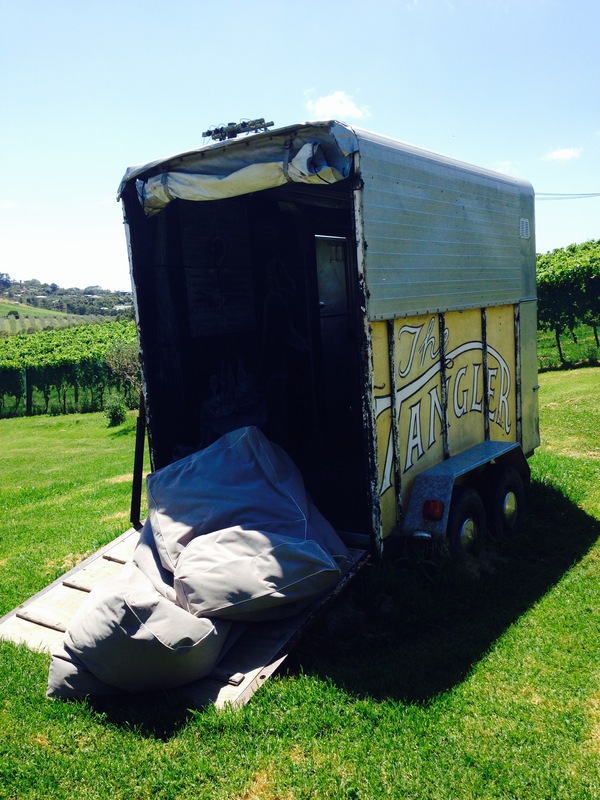 Casita Miro was a new vineyard on the Waiheke Island Wines tours trips so it was apparently a bit of an experiment. 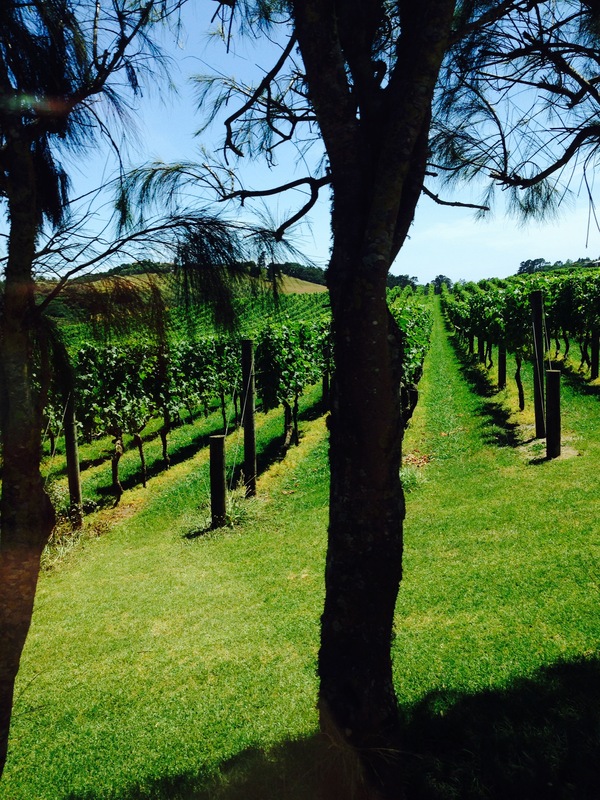 The setting was different yet again, the vineyard was owned by one of the 12 or so doctors on Waiheke, who was also an artist, evident by the mosaic walls he had crafted up the path from the restaurant to the tasting terrace. Tim and I decided that two vineyards down was an appropriate time to crack out his selfie stick. The group went wild for it, Graham was a little shy at the back but we managed to get a snap of all of us. After all that wine we decided that a spot of lunch was needed, so Graham recommended a little Italian place in Oneroa town near the ferry port. The food was good but service was slow so we had lunch then just had a few minutes to stroll around the town and grab a gelato from a shipping container stall set up by a woman who was in the final of NZ masterchef before piling back into the minibus down to catch the 4pm ferry. We had a little rest when we got back to the hostel before heading out for dinner to a place called ‘Depot’ on Federal Street, just around the corner from the hostel. The food was brilliant. I had a charcuterie board which came with popcorn duck tongues. I couldn’t eat them without the image of a poor little tongueless duck springing to mind but wow they tasted good. Tim had steak and Fiona had mussels. Depot’s speciality is oysters and I could see a guy shucking them behind the counter. The mussels were huge, so meaty and no fishy taste, they had a great sauce too. A man who wasn’t in staff uniform came over to ask us about our meal and it transpired that he was Al Brown, the owner. He’d also recently opened another place called ‘The Fed’ next door to depot which was set up with an old NYC Jewish deli feel. I complimented him on the duck tongues and he said that they only get them about 4 times a year when the duck farmer has enough to send to him. Apparently they arrive with a strip of cartilage down the middle so they have to be soaked for a couple of days and then this has to be removed, then they have to be ‘popcorned’, so it’s all rather laborious but the result is delicious. We said goodbye to Fiona that evening as she was up super early the next day to go off on a bus tour. The next day Tim and I hired a car to go to the West Coast beaches. It was very basic and the USB cable I’d brought with me for car tunes seemed ridiculously optimistic in hindsight. We drove out to Piha Beach, stopping off in the small town of Titiranga to pick up some picnic supplies for lunch to supplement the boxed up bits of the charcuterie board that I had been unable to finish at Depot. 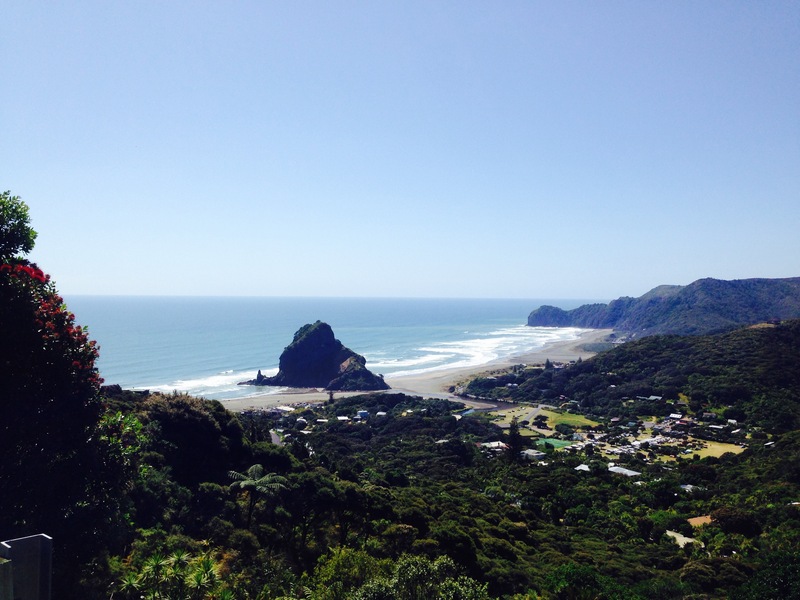 Piha was stunning. When we arrived it was about 10am and the beach was pretty empty. 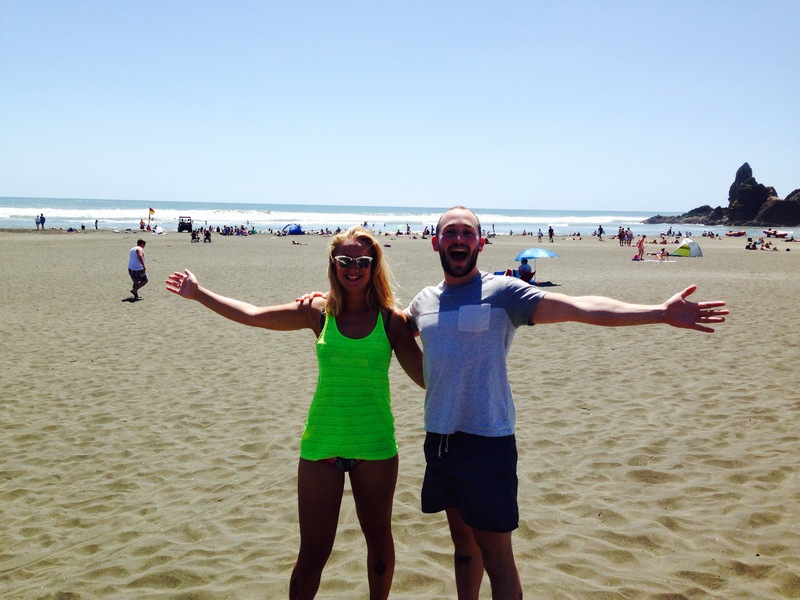 We walked across the warm “black” volcanic sand to find a place to settle for the day. I was disappointed as it wasn’t as black as I’d imagined but you could definitely tell the difference from regular sand by how hot it got by the end of the day. Flying out of Auckland today I could see the beaches from the air and they really did look black. The national surf championships were taking place on the beach so we spectated from our towels. There was a commentator on a loudspeaker who was saying that the sand was melting peoples “jandals” (flipflops) and that one of the surfers who ran the 400m or so from the sea up the beach barefoot ended up with blisters on his feet! Our way of dealing with this situation was to remain very still on our towels. All day. Just to be safe. It was amusing watching people trying to make the long run down to the sea without shoes. They’d get about 50m then jump on whatever they could: on their towel, on someone else’s towel, on their friends. They’d then make very slow incremental progress down towards the sea. The sea was so refreshing, but the current was SO strong. Apparently there is a show called Piha Rescue specifically focusing on all the accidents there. The ‘safe’ area between the lifeguard flags was only about 10 meters wide and when I went in next to one flag and did a couple of strokes of breaststroke forwards I found myself in line with the other flag. Luckily the tide was coming in, so actually it was only a battle to get out to where the waves were breaking to playing in them. Once you wanted to come back in you just had to let the sea do its thang. We were pretty boiled by about 4pm so began the de-sanding process and the drive back to Auckland. It was still relatively early when we were done with dinner so we asked the waiter for recommendations of where to go after. He started trying to give me directions to a little cocktail place then decided it was too complex so drew me a map! We found it no problem, it was called ‘Mos’ and did delicious cocktails. I had a couple of French 75s and Tim had an old fashioned and a whiskey sours. We were then a little sozzled and ready for bed. 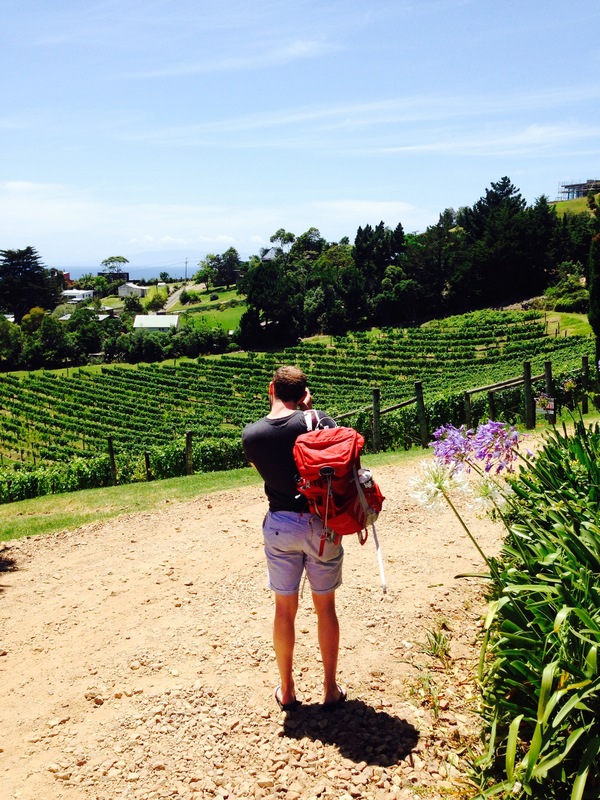 Luckily Tim had packed his rucksack when we got back from the beach as he was getting up at some ungodly hour to go an catch the ‘scenic train’ across the north island before beginning his tour bus adventures. It was great to finish my travels with a friendly face. 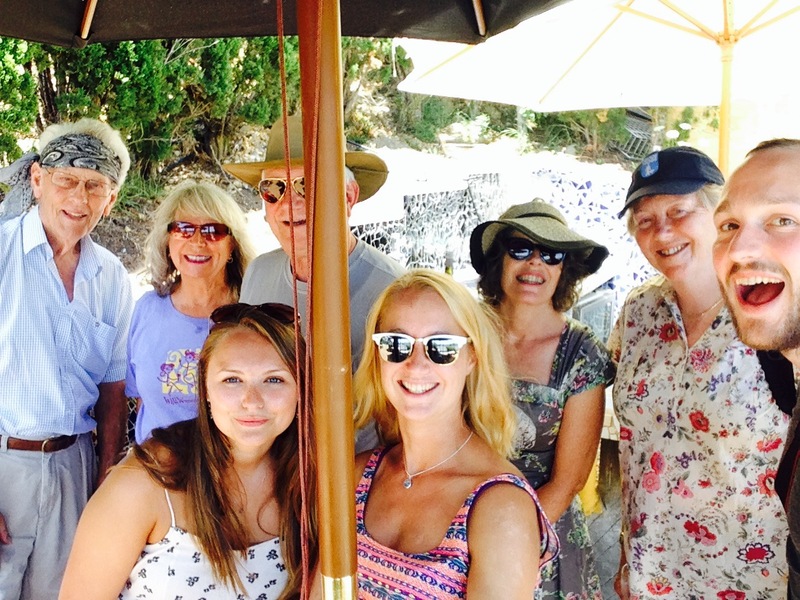 I’ve really enjoyed the way I’ve done it, solo travelling regularly punctuated with guest appearances from friends. It means that I planned my trip with all the selfish flexibility of doing everything I wanted, and then have had fantastic company to do it with! 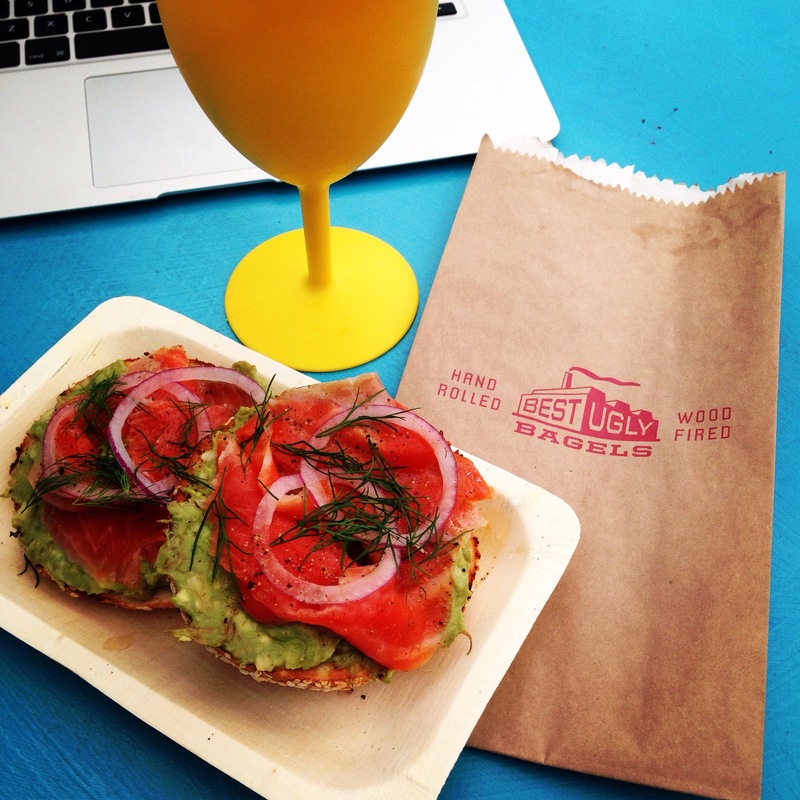 This morning I had a little lie in, checked out, and then went for a stroll to ‘Best Ugly Bagels’, which had been recommended by Al Brown and when I got there I realised why as it was another one of his places. It was in a sort of car park/warehouse yard which had loads of cool food places all around the edge. As with both his other places it was great quality and a very slick kitchen operation. There was an open bagel oven so whilst I waited I watched the process of taking a slice from a giant dough loaf, rolling this into a mini dough bagel, these being placed in the oven and slowly flipped and moved across the oven until they were ready to be pulled out on a long thin bagel paddle and served up. I ate this back at the hostel and then got all my stuff together for the bus to the airport. As I walked to the bus there was some drama on Queen Street as a police van screeched to a halt outside a bank and all the officers ran in armed, but I didn’t see anything after that and by the time the bus went past customers seemed to be going back in so it can’t have been too serious. My flight itinerary told me that my flight to Sydney left from terminal D of Auckland airport. When I asked the bus driver he said he’d never heard of it but asked where I was flying and who with. When I said Sydney and Jetstar he told me that would be from the domestic terminal. I double checked that even though I was flying to Sydney and he said yes, so I presumed that the ‘D’ must indicate domestic terminal. I disembarked the bus there and headed in, only to see that (obviously!) all flights were going to NZ destinations. I asked a Jetstar representative and they looked at me like I was an idiot and said that I should go to the international terminal. I was running a little later than I’d planned to so I ended up back full circle how I was at the start of my travels in Victoria station London back in early November. Shuffling the 15 minutes to the international terminal like a frantic tortoise, except this time I had a broken rucksack and it was about 30 degrees outside. What a treat. I was cursing that bus driver the whole way. of our accountancy college year group from Deloitte, all of whom relocated to Sydney. This weekend I should be moving into my new flat, and will keep you posted on my adventures from there!! Hope you’ve enjoyed following Where’s Wallis and my travels around the globe and that I’ve added a few “must visit places” to your list.